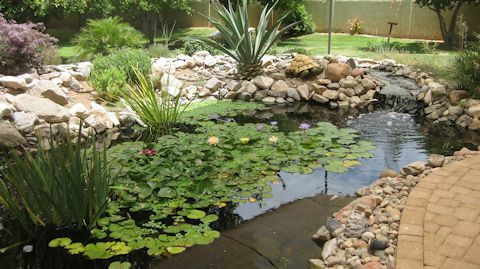 I thought I would do a quick update of the pond now that it is July of 2014 and we are in the throes of monsoon season. The shade cover has been up since May and is doing its job. It has stretched and when it is taken down this year there will be work to do to tighten it up. The fish are all doing well despite a recent heron scare. I feed them once a day around 3 PM. For several months they have taken to massing together and following me as I walk along the pond’s edge until I feed them. 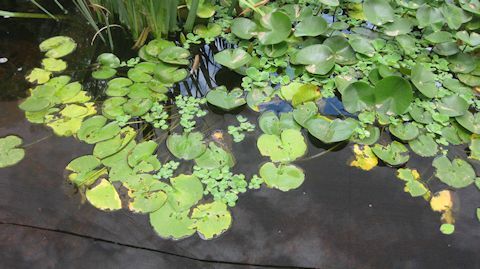 What has really amazed me is the plant growth both in and out of the water. On our last trip to California I purchased a few, maybe half a dozen, water lettuce plants. I threw them in the pond and they took off. The lettuce has proliferated so much that the other day, I scooped about half of the plants out and threw them away. It was getting to be too much and the lettuce was crowding the water lilies and snowflake plants out. I suspect that I will be periodically scooping some out. 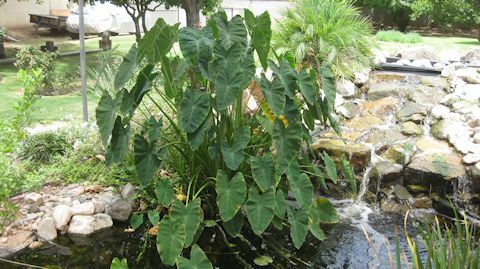 When the pond was first started, about 3 years ago, a friend gave me two small Taro plants. Well, it’s taken them awhile but this year they have exploded with growth and look magnificent. I received some lotus seeds and decided to try to grow some. After three tries with seeds I have finally succeeded. With the first two sets of seeds, they would “hatch,” grow leaves and roots but everytime I put them in the pond it was just a matter of time before they died. I now know the secret. Start your seeds in the hottest part of your summer. 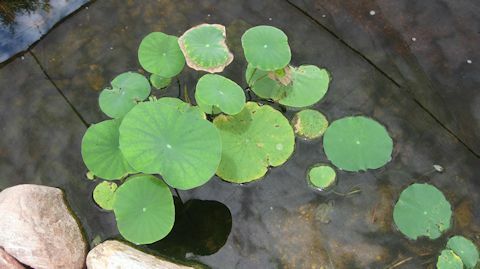 Wait until you have at least four leaves and a healthy set of roots before you pot them and place in the pond. The lotus love hot weather and apparently the hotter the better. 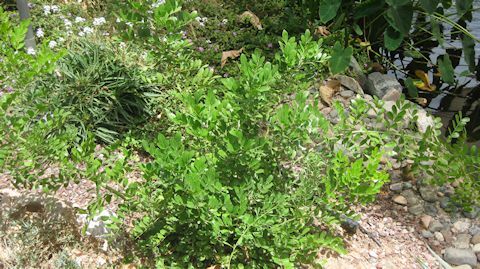 Last summer we planted 3 Mountain Laurel. It took them awhile to take hold but they have finally done so. Right now they look like lanky, ungainly bushes. When they get a bit taller they will be pruned to one major cane that will eventually become a tree. We love our Koi pond! 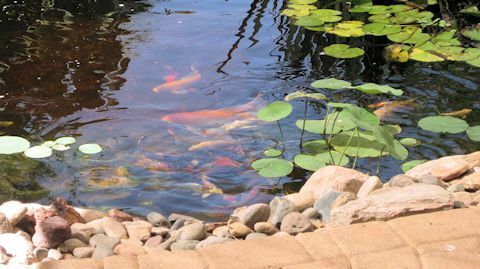 We have had countless hours of joy watching Koi antics and watching the pond vegetation mature and look like it belongs there. Was it worth the investment? You bet!